For many of us, this is the ultimate life goal. Before we got off the hamster wheel of living paycheck to paycheck, we never could have dreamed of reaching FIRE. After we finished paying off over $24,000 of debt in less than a year, we realized that achieving financial independence was a huge goal for our family. How we're getting there is a little bit different than what most people are doing. What is it? We're working towards FIRE by building an off-grid home by hand. We sold our little mid-century ranch in the suburbs to buy 16 acres of beautiful raw land. We are currently in the final stages of building a cordwood house, “off the grid”, with our own hands. 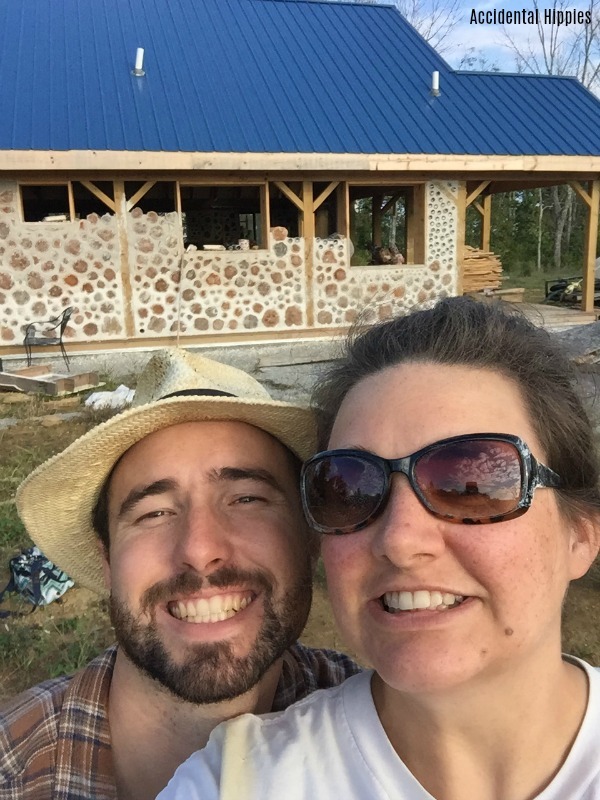 We’re building a home with our own hands out of something called cordwood masonry. Cordwood is a natural building technique using short logs laid in mortar. If you've never heard of this technique before, I highly recommend reading more about it here. 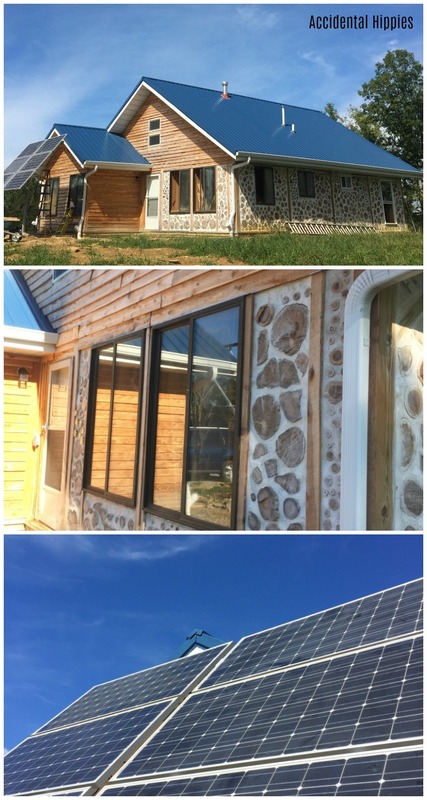 We chose to build with cordwood because it is beautiful, unique, inexpensive, relatively easy for an owner-builder to do, and has a fairly low environmental impact. Our home build started with a LOT of planning. 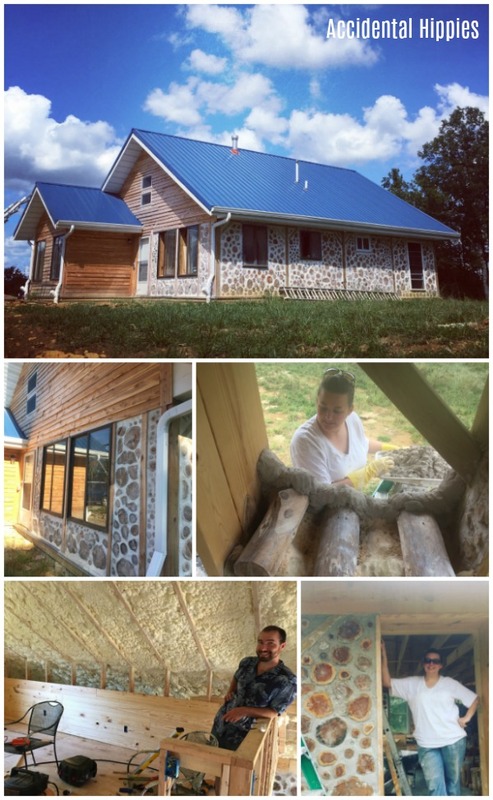 In addition to the years we spent researching cordwood masonry, we spent a lot of time finding information on what it would take to buy a property and build a house from scratch. This included working with local code officials to make sure we could build our house safely and legally. Before we even had permits in hand, we got to work cutting down the trees that we would use to build our walls. In the first summer we owned our property we cut down between 50 and 60 red cedar trees. We peeled the bark off the trees, cut the logs into 16 inch lengths (the thickness of our walls), and set them to dry in a shed we built. We knew that it would take at least a year for the logs to dry before we could build with them, so we invested a lot of time in prepping enough logs even before we had our building permits. Since we were both teachers at the time, we worked as hard as we could during our summer breaks, school holidays, and weekends. With the exception of the big stuff like the excavation, concrete foundation, spray foam insulation, and our roof, we did all of the work ourselves with occasional help from family and friends. The two of us set our own posts and beams, ran our own radiant heat, did our own plumbing, wired our entire house, installed our own solar power, and are in the process of doing all of our own finish work. And of course, we constructed all of our cordwood walls by hand. Our own actual blood, sweat, and tears are literally (and not figuratively) inside our walls. Every inch of the house has a story attached to it. What does “off-grid” mean for us? Off-grid means that our house isn't connected to any local utilities for water and power. Electricity is provided by solar panels in the yard and we harvest rainwater from our roof to store in an underground cistern. Off grid DOESN'T mean that we're changing our names, destroying our identities and living away from civilization. It doesn't mean living without the internet either (obviously). For us, off grid means being self-sufficient and making conscious choices about our consumption. How does building an off-grid home prepare for FIRE? Our homebuilding project was just supposed to be a cool way for us to save money on a home. However, over the past two years of building it has done SO much more than that for us. This house has completely rewritten our plan for achieving FIRE. First, building the home ourselves has saved us a significant amount of money. Not only did we save at least 20% by not hiring a contractor, we saved significantly on labor by doing the majority of the work ourselves. We also paid for the majority of the build with straight up CASH. Cashflowing most of the build allows us to avoid paying interest on a much larger home loan. Putting what little mortgage we do have on a 15-year will save us money over a 30-year, though the goal is to have it paid off in 7 years or less. Living off-grid can save money too. Living off the grid makes you keenly aware of your own consumption. Reducing our needs for power and water not only save resources but also mean we save money by installing smaller, more efficient systems. Having solar and rainwater means that we won’t be spending money on utilities every month. If we choose, we can take the amount we would have paid for water and electric and stash it in savings and index funds to prepare for maintenance and replacement of our systems down the road. While being off-grid has saved us money, the real path to financial independence is in the mentality we've adopted as a result of this project. We always had inklings of this ethos in ourselves. We would do little things like keep a small garden, make our own cleaners, and learn to fix up and repurpose things instead of buying new. But the exhausting process of buying land, creating a home plan, jumping through the permitting hoops, and then physically building the home ourselves REALLY taught us how much we value a homesteading lifestyle. These values are what keep us on the path towards FIRE. Because we value living debt free, spending less than we earn, and doing for ourselves, we naturally create habits that keep us out of the cycle of debt and mindless consumer spending. We are empowered to live on less and to create a life of abundance with what we have. Is building an off-grid homestead for everyone? Probably not, but it is definitely worth exploring. Our lives have changed radically for the better in the two years we've been working on our home. I can't imagine wanting to go back to our normal little suburban life! Even if you aren't ready to sell your home and move to the woods just yet, remember that incorporating a bit of the homesteader's mentality into your daily habits will start changing your course towards financial independence. The trick is doing what you can where you can. Do things like make your own cleaners or mend your own clothes. Plant a container garden or visit the farmers market. Make your own healthy food at home instead of buying convenience foods or eating out. Every little bit adds up, and over time you may just find that thinking like a homesteader is helping YOU on your path to FIRE. Emily is an off-grid homestead blogger who paid off $24,000 in 11 months. Her goal is to share tips, tricks, and knowledge for building a self-sufficient life. Check out Emily’s blog at accidentalhippies.com. Follow her on Facebook at Accidental Hippies. Did your city/state have any issues with you living off the grid? I recall an article recently about a woman in Florida who wanted to do the same thing, but the state (or city, I forget which) wouldn’t let her be totally off the grid – she HAD to be hooked up to electrical or water or something like that. Very interesting story, thanks for sharing! OK this is so cool! I’ve always been interested in homesteading to some degree. I just bought a brand new home that I’m rather fond of, so I’m not about to go off the grid any time soon lol. But I have about 5 acres to work with to garden or farm. I’m all for reducing consumption and being eco mindful, and if it saves you money it’s a win-win! This is great to read and see; the house looks awesome (especially the uniqueness of the walls, I’ve never seen anything like it). While I myself would not live off the grid, I think articles like this one show that not only is it viable, but also desirable (as opposed to the stereotype of recluses that withdraw from the outside world). Amazing work Emily and Mark! What a fascinating story! I love the fact that you guys planned for so long before starting. My tendency is always to jump in and learn to swim on the way down. In the case of building a house, I think that would be a terrible way to go about it. So good for you guys for being such careful planners! The house looks like it’s going to be beautiful, and how cool that you’re “off the grid”! This is awesome! I love what you and your husband are doing. Chris, my husband, and I have always loved the idea of living off grid. Thanks for sharing your journey! This is so awesome!! Thanks for sharing. We homestead as well and have been dreaming of building a small, off grid cabin on the back half of our property (after the mortgage is paid off). Can’t wait to see how your house turns out, good luck with finishing! Thats definitely awesome, although you guys are probably spies and going into hiding. But seriously I would love to at least have solar panels installed someday (They are getting cheaper). We live in Miami and theres plenty of sun to power most things, and with the Tesla Solar Wall, I think it could power through the day. The goal being to lower all our bills before that day we quit work.